CLIENT: Courtney & Patterson Pty. 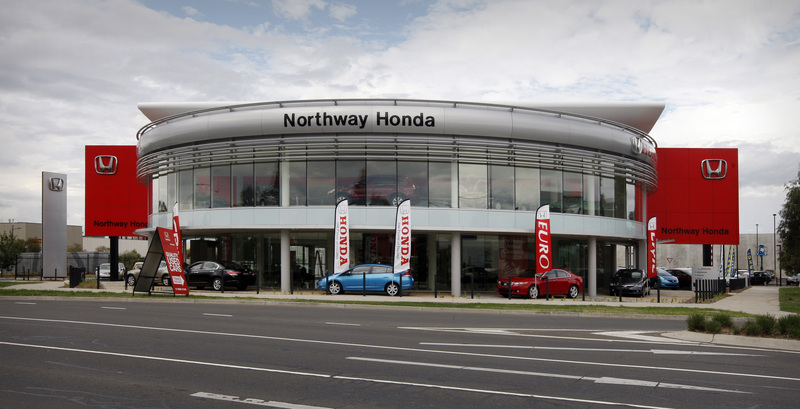 Ltd.
Klopfer Dobos was engaged to produce cost effective and detailed building plans for Honda Australia’s new state-of-the-art car dealership and workshop in Bundoora. The challenge was to maintain the unique architectural elements of the design while simplifying construction methods and minimising costs. To achieve maximum glass frontage and maintain the desired impact of the finished building we focused on minimising the structural bracing elements required within the design. We also implemented a range of structural features which reduced costs without in any way compromising the architectural intent of the design. – a lightweight truss system to support a cantilevered roof wing feature which was made to resemble the rear wing of a Formula 1 car. All of which combined to result in a visually stunning, state-of-the-art showroom and service centre.